Robin Rose isn't just a painter. He's also a collector of modernist furniture, several examples of which appear throughout "Robin Rose: Cypher": a dining room set, metal patio furniture, etc. You'll find another side of him on view as well. In the late 1970s, Rose was the keyboardist for the new wave/art band Urban Verbs. You can see his love of music in his encaustic paintings, whose rhythms and layers are the visual equivalent of a wall of sound. 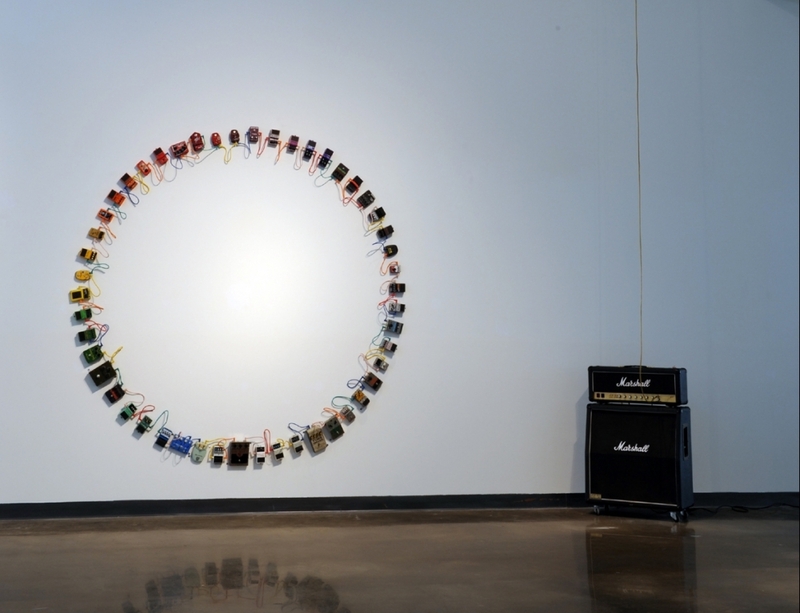 You'll also see it in his "Isolation," a circle of guitar effects pedals mounted on the wall at the American University Museum, each one plugged into the next in an endless feedback loop. It's there also in "Ascendant," shown here, an installation featuring a Marshall amplifier and electric guitar, that latter of which has risen, Christ-like, to the ceiling. Call it the apotheosis of the axe.